Mark Abman is a Colorado native, dad-joke enthusiast, and three-year improviser. 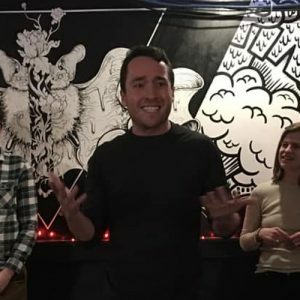 Mark currently improvises with the High Fivers – the number one high-five-based improv team in the DMV – and has previously improvised with Swoonface. In the past three years, Mark completed the WIT curriculum, has read numerous books on improv, and regularly frequents local improv theaters. Mark has run two ultra-marathons, has a twin, and studied abroad in Jordan. He enjoys petting dogs he meets on the street, drinking unhealthy amounts of coffee, and making people laugh.